Electric scissor lifts have a powered drive mechanism and four wheels for smooth movement around a job site. These lifts are meant for both indoor and outdoor work. When they are collapsed or folded, they can fit through standard doorways. 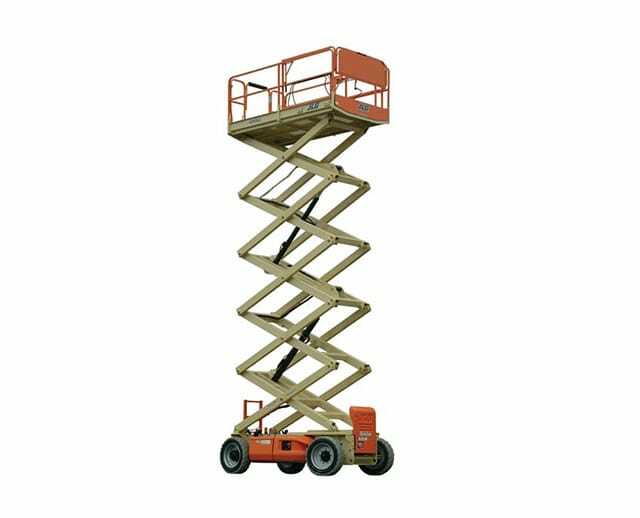 Scissor lifts have fixed-frame wheelbases for extra stability. If you are working on rough or uneven terrain, some models offer stabilizing legs for additional support. 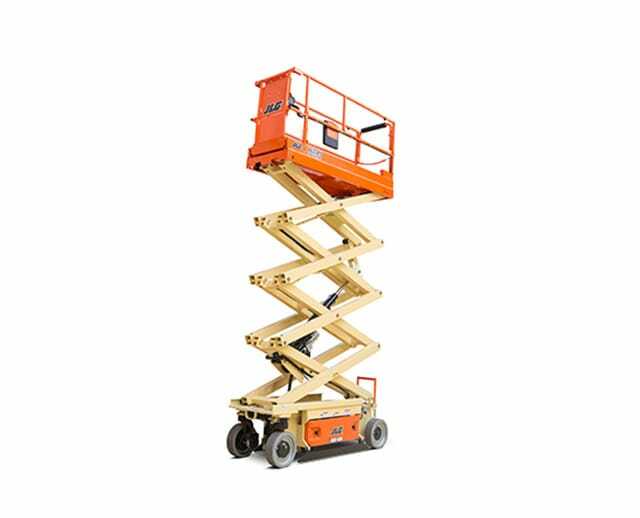 The electric scissor lift is a type of aerial work platform that can move only vertically. Raising the platform involves turning to one of the interlinked folding support rails that form an X-shaped pattern. This X is the scissor and creates the upward motion to raise the platform. The interlocking support rails offer a stable platform that can accommodate more weight and workers than a standard man lift. Scissor lifts are one of the most commonly used aerial work platforms and are used on many types of jobs. Many have extendable platforms to increase their overall working area. They have applications for construction sites, maintenance, landscaping, and photography. While electric scissors lifts are incredibly versatile, they are the most useful in specific job situations. Scissor lifts do well indoors. They are one of the most lightweight and easy to move lift choices. For use outdoors, some models offer stabilizing legs to handle grades and uneven surfaces. Size is a key feature of a scissor lift. Smaller personal man lifts are meant to hoist a single worker and materials into the air. Electric scissor lifts are used to create an aerial work platform. While they do have an extendable platform, they can't extend into other areas or across obstacles. Electric scissor lifts are perfect for ceiling work, construction, sign hanging, and maintenance. They are not, however, able to get into tight spaces for items such as HVAC ductwork or electrical work. 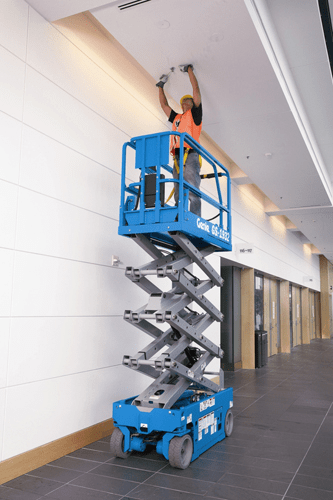 An electric scissor lift can be used for a variety of jobs. Indoor jobs include installing ceilings, painting, hanging lighting, and any task where the work area is above the reach of a typical step ladder or the work area is directly overhead. Electric scissor lifts have a long history in helping photographers and videographers gather fixed aerial shots. These lifts are also used for hanging lighting and sound rigging and setting up special effects. Mechanics have used lifts in their shops for decades. Not surprisingly, scissor lifts have been involved almost every step of the way. These lifts take the form of lift tables or dual-side body lifts. You must consider what you'll be lifting with the electric scissor lift and make sure that you get the right lift for your jobs. Working space is also a significant consideration. 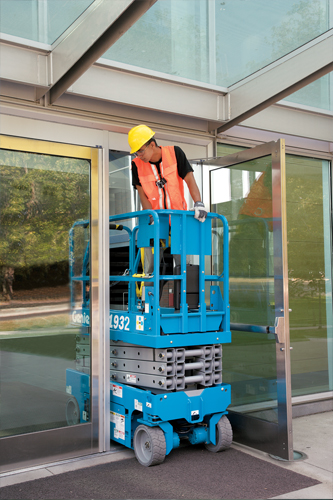 Measure all doorways and hallways to make sure that your electric scissor lift has enough clearance and height. Since the inception of the electric scissor lift, many companies have made this equipment a part of their product lineup. Each scissor lift manufacturer has multiple models that will fit almost any job. Two names stand out above other manufacturers in terms of quality and safety. 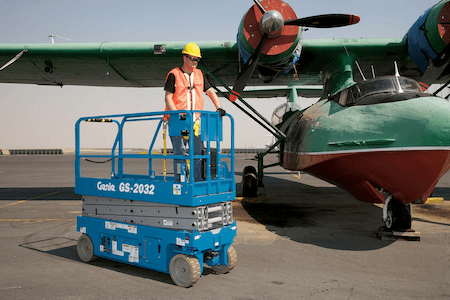 JLG and Genie have consistently been the front-runners in scissor lifts for decades. 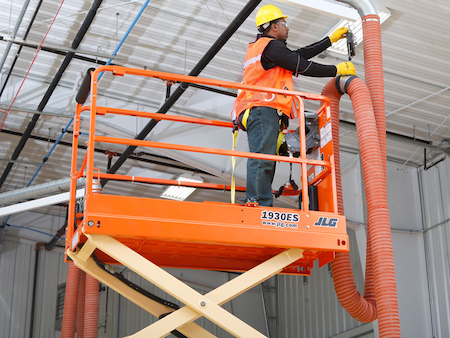 JLG was the first company to offer a commercially available electric scissor lift domestically. Founded in 1969, JLG has been working to perfect its designs by continually focusing on quality, technology, and engineering in all of its models. 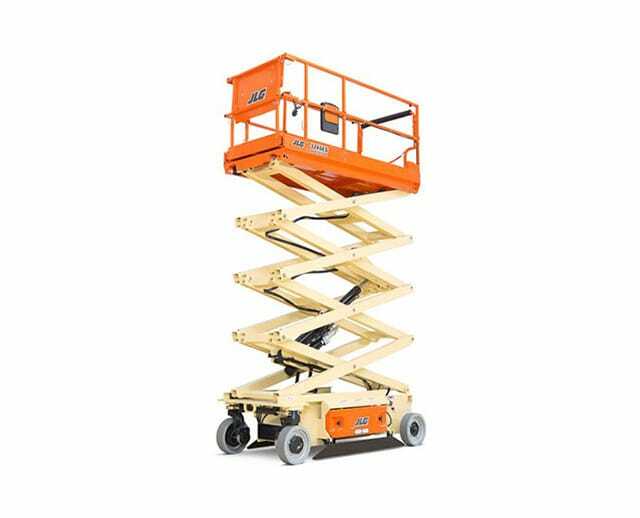 The company's most significant innovation in the early days was the manufacturing of the aerial platform which made the scissor lift what it is today. Electric: The electric scissor lift has an electrical drive system that doubles the machine's battery life. These types of lifts are ideal for indoor work because workers do not have to deal with fuel emissions. Electric lifts offer heights ranging from 20 ft to 41 ft. Machine widths vary between 30 inches and 69 inches. Be sure your doorway can accommodate the width of the scissor lift you choose. Engine Powered: These lifts have larger platforms and can accommodate greater a lift capacity. The aerial work platforms available vary in size from 69 inches to 81 inches wide, and height can range from 32 ft to 49 ft. These models come available with rough-terrain wheels and stabilizers for outdoor work. These lifts operate with electricity and work both indoors and outdoors. They are relatively easy to maneuver in tight spaces and have a lift range of 21 to 46 ft, and weight ranges from 500 lbs to 1,500 lbs. Rough-terrain lifts are made for outdoor use. They have four-wheel drive, larger aerial work platforms, and stabilizing legs. These features make them ideal for outdoor jobs. Heights range from 32 ft to 59 ft, and they can handle up to a 50 percent grade. Weight capacities vary from 800 lbs to 2,500 lbs. Every brand has multiple models in varying height ranges and lift capacity. The important points to look for are lifts that will be able to maneuver where you need them to go and the right type of lift for indoor or outdoor work. JLG scissor lifts demonstrate long-lasting performance. These electric lifts are designed to make quieter work areas and require less dependency on hydraulic fluids. 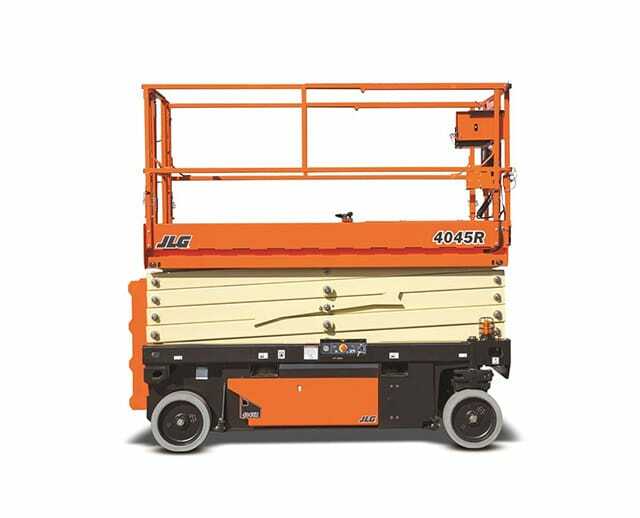 The ES series is the middle size of JLG's electric scissor lifts. These electric scissor lifts are ideal for indoor work. The narrower width of 33 inches allows these scissor lifts to fit through standard-sized doors and operate in tighter areas. They have a max height of 25 ft. The electric drive system also provides for 200 percent battery life compared to other models to let you stay on the job site longer. Integrated components such as two hydraulic hoses and four hydraulic fittings allow for better efficiency and power. Genie prides itself on its long-standing reputation for quality and durability. Its GS series of lifts offers proportional controls for lift and drive functions. The GS-2032 sets the series standard for versatility to be used for both indoor and outdoor jobs. The electric drive system offers increased battery life, which means more work without recharging. The platform height extends up to 20 ft, making it perfect for indoor applications. The machine width is 32 inches which allow it to fit through standard-sized doors and make tighter turns. In the world of electric scissor lifts, with many similarities present among the different brands, choosing the right lift is almost impossible. Understand the working height. Know how high the lift can safely raise the platform and remain stable. Since manufacturers make lifts in different heights, make sure you know what your requirements are. Know and understand what exactly you need to lift. It's not only the platform and workers. You may need to lift materials and heavy tools as well. Also make sure that all materials, including the operator, meet lift capacities. Electrically driven and diesel-powered lifts exist. The electric type offers quieter operation and extended battery life. However, it sacrifices a bit in power. This type is good for working indoors. Diesel-powered lifts are more powerful, but they carry fuel emissions and are louder. They're better suited for working with heavy loads outdoors. If you're going to be working indoors on flat surfaces, then a fixed frame lift can work for you. If you are working outdoors on uneven ground or grades, look for a rough-terrain lift that has stabilizer legs. When comparing JLG and Genie lifts, take a look at comparable models. The two listed above, the JLG 2632ES and the Genie GS 2032, are comparable models. Both have operating widths that can fit through standard doors and have similar weight capacities. They both have an 800-pound platform limit. The difference here is that the JLG has a platform extension that can handle up to 300 lbs. 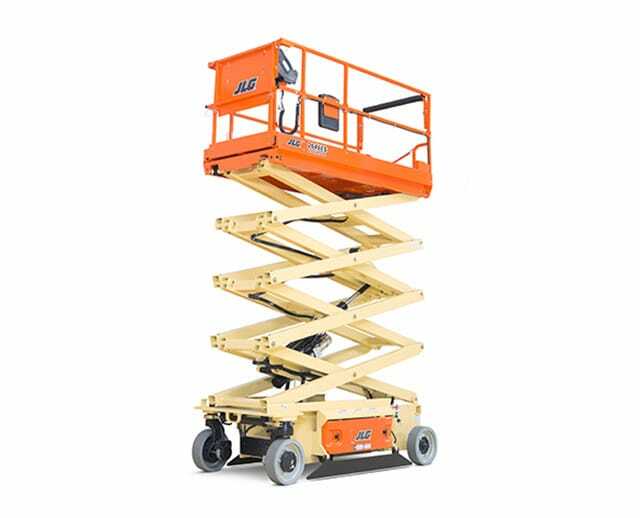 The JLG also has a better lift height that maxes out at 25 ft compared to the Genie which has a top height of 20 ft.
Like any other piece of heavy equipment, hazards likely go along with operating an electric scissor lift. Proper state-certified testing would help to reduce the likelihood of accidents on the job site, but hazards are still present. 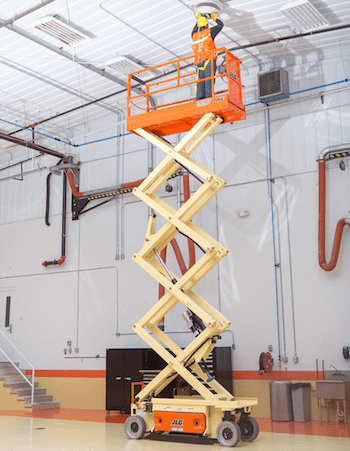 OSHA has identified five common hazards that contribute to most scissor lift accidents. Falling is always a danger when working from heights. Falls most commonly occur when workers fail to wear proper harness gear. They may also attempt to extend beyond the reach of the platform to avoid having to descend and move the lift. Falling accidents are also common when employees try to move the lift while the lift is extended. Always be aware of your surroundings. Accidents that involve getting trapped between objects happen in one of two ways. In the first instance, the operator raises the platform and fails to notice overhead objects, thus becoming pinned between the lift and the objects. The second most common occurrence takes place when operators are moving the lift and fail to notice other workers. Scissor lifts can be used outdoors; some are made for rough terrain. These models have stabilizing legs which balance the equipment before the platform is raised. However, the ground itself has to be stable. Stopping on sand or gravel with a gradient can cause severe accidents for lift operators. Falling is one of the worst outcomes of stopping on unstable ground. If the platform is loaded and fully extended, the top of the platform becomes heavier than the bottom. If the ground is unstable, the difference in weight could cause the equipment to shift. This instability can result in the lift falling sideways. Any time a potential for falls exists, workers on the platform can get harmed and workers on the ground can get crushed. Working around power lines presents additional dangers and challenges. To begin with, if the lift moves, operators could come into contact with live power lines and become electrocuted. Avoid operating a lift too close to power lines, and always wear the proper safety gear. Understanding the most common causes of accidents associated with electric scissor lifts is a big step in preventing them. The biggest part of avoiding accidents is to always follow proper safety protocols on the job site. Safety should always be the primary focus of any job site, and safety starts with the operator. The two biggest steps you can take to make sure that your work site is free of obstacles involves inspecting your site and your equipment. Never use a piece of equipment with damaged housings or casing. Make sure that no fluid leaks or frayed electrical components exist. Further, ensure that all safety systems are intact. Clear away any obstructions that can make the area unsafe while operating an electric scissor lift. Finally, check for any downed power lines, large debris, or precariously hanging materials. Harnesses should always be worn when the lift is extended. If the operator begins to fall, the harness will catch and prevent the worker from going over the edge. The harness can also stabilize operators if they trip on the platform. Lifts should never be moved while extended. Lowering the lift and letting the operator off before moving it may take time. However, moving the lift while it's extended exponentially increases the risk of tipping over. U.S. Occupational Safety and Health Administration (OSHA) standards recommend leaving a 10-foot clearance around all energized power lines. Always be mindful of width clearances as well. Measure your worksite accurately and buy or rent the properly sized lift. Hard hats are a must on any construction site. Wear hard hats at all times to minimize the risk of banging your head while operating a lift. If working near power lines, make sure to have the proper nonconductive safety gear. Visibility vests are a safety precaution to make sure everyone knows you are on the lift. Body harnesses should also be worn at all times while the lift is extended. OSHA requires certified training for any worker operating an aerial lift. This training can be done at an OSHA-approved facility or through a few online providers. Training is one of the biggest ways to prevent accidents on the worksite. Trained workers are generally more productive. They tend to cause fewer on-site accidents in the long run. Genie offers a comprehensive online training program which can be purchased directly from BigRentz. These web-based courses satisfy all OSHA, ANSI, and CSA Requirements. The course is separated into two parts. The first is an online virtual training platform. With this platform option, operators learn safety protocols and how to operate controls safely. After the course is completed, students must pass a practical exam. Once the exam is completed, students only need an on-site refresher to be a certified operator. The first company to make commercial scissor lifts offers a complete online experience. The immersive platform allows operators to get full training on the controls and safety procedures associated with aerial lifts. JLG also offers on-site courses with a trainer. Allowing unlicensed operators to use machinery on your job site greatly increases your risk of accidents. Not only does this situation involve delays, but potential lawsuits, too. Insurance companies can deny any claims resulting from such accidents, and the state where you're operating can take away your license. Charles Larson originally patented the movable scissor lift model we think about today in the 1960s. Prior to the X-shaped pantograph support pattern, lifts used a single post to raise platforms into position. The original design, however, dates from 1925. Historically, single-post lifts were challenging to use and relatively unsafe. 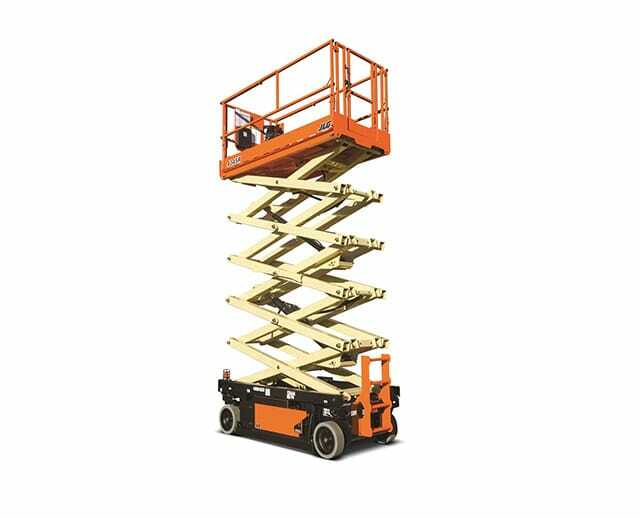 The modern scissor lift as we know them use a mechanism made of interlocking support that forms an X shape or pantograph. Lifting action is created when the support arms extend and make the pantograph narrower. Each pantograph moves in tandem, creating an even rise and stability from both sides of the platform. This mechanism was patented in 1966, and by the 1970s, it was in full production. Larson's design for the pantograph scissor lift mechanism was so desirable that the design is still in use today. The double bar supports on each end of the platform allow for greater stability and security. The new support system permits the ability to use wider platforms and greater weight capacities than older single-mast platform lifts. 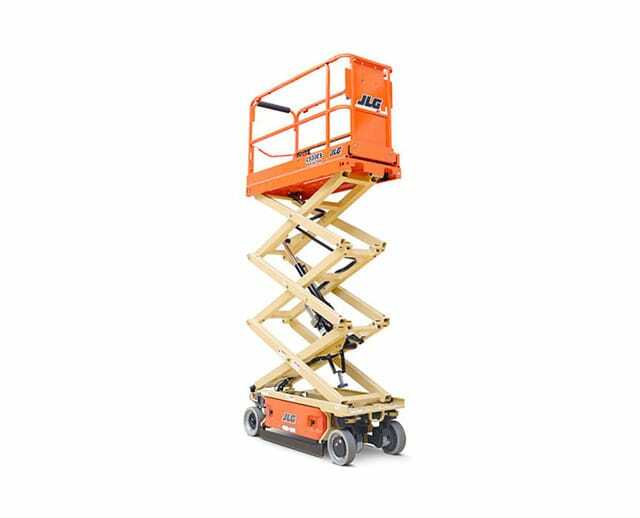 In 1976, JLG became the first company to offer the scissor lift commercially. After seeing the versatility of the lift, many other companies followed, including Meikikou in Japan, which released its N-Series in 1977. 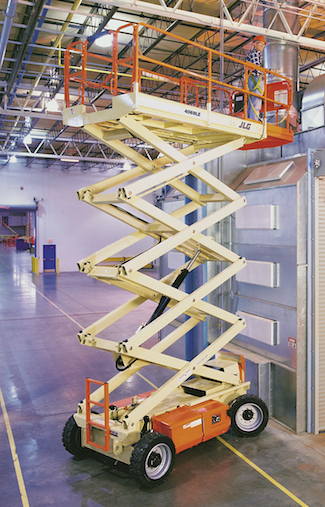 In 1998, JLG produced its 50,000th scissor lift. Over the 50 years since Charles Larson patented the first scissor lift, companies and individuals have filed dozens of patents and designs for scissor lifts. While design patents related to powering the scissor mechanism have existed, Larson's design was so beneficial that few significant improvements to the actual pantograph design have been made. The year 1975 brought one of the most significant enhancements to the electric scissor lift. In the original design, the hydraulic system in the lowest tier was mounted horizontally to align with the support bar. The redesign included a cylinder lift unit mounted at a fixed angle, which aligns the lift force with the vertical axis. In 1987, the pantograph pattern was reduced in size and given personal use capabilities. The first screw-type scissor style jack patent was filed shortly after. This design became the industry standard for lifting cars, and a scissor jack general comes included with every new car bought in the United States. How easy is it to operate a scissor lift? Powered scissor lifts don't require any special equipment to move around the job site. Make sure you have enough space to maneuver before renting the equipment. The ease of operation comes with proper training. If you find that the job requires a material handling lift that will need you to handle more or less weight, contact BigRentz to get the one you need for your job. Can I pick up or drop off my own equipment? For insurance purposes, you may not pick up or drop off your own equipment. All equipment must be transported via BigRentz. BigRentz offers a range of options for material handling scissor lifts in many different heights and terrain ranges. BigRentz offers pricing options for daily, weekly, and monthly equipment rental rates. Electric scissor lifts offer one of the most popular lift platforms on any job site. They are great for ceiling work, painting, maintenance and doing any overhead job. 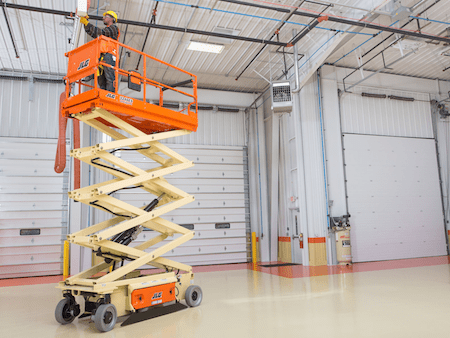 With a variety of sizes and aerial work platforms available, including articulating boom lifts, choosing an electric scissor lift to buy can be difficult. Thanks to BigRentz, you can find a wide selection of lifts to meet the specific needs of your job site. To learn more about your electric scissor lift rental options, preview features of various lift models, and place an equipment rental through BigRentz, contact us at (888) 325-5172.